The name of any sports team says something about the nature of the game being played. It's revealing to note, then, that the NHL has more teams named after natural disasters than any other pro sport: the Flames, the Lightning, the Avalanche, and perhaps most indicative, the Carolina Hurricanes. These names alert fans that they're watching, not a game of slow precision or deliberate grit, but of collective fury and fast-paced skill. Caught in the "eye," if you will, of this NHL storm are athletes brave enough to hit the ice in what is predominantly considered a rough-and-tumble sport. (Evidence: It's the only sport in which fighting is unofficially condoned.) 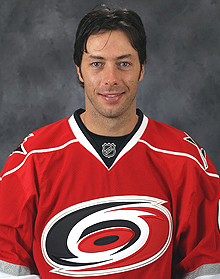 Though, for Christian Hurricanes Cam Ward and Matt Cullen, the sport's toughness is merely the way to play the game. Throughout their careers, both have learned to harness the aggressive hockey mindset and use it to give glory to the One who gave them the ability to compete at all: Jesus Christ. As the 2009 season gets underway — and just as FCA's national hockey ministry enters its second year — Ward and Cullen share their thoughts on what it means to compete for the Lord on the ice and why hockey could take FCA by storm. • Last season, Ward established new franchise records for goaltender victories in a season (39) and consecutive victories (9), and also matched the franchise record for shutouts in a season (6). • In 2006, he became the first rookie goalie to win the Stanley Cup since Hall of Famer Patrick Roy in 1986. STV: Hockey is a rough sport, and it really takes a certain level of toughness to play it. How is that a reflection and an extension of your faith? CW: In a way, it reflects how you have to stand proud and strong for what you believe in. When you look at hockey players, we do play a rough, tough sport, but if you talk to most people off the ice, they're just big teddy bears. We just have to change our mindset when we get on the ice. But truthfully, I think you'll see that hockey players are some of the nicest people you'll meet in sports. STV: Is that one of the things that would surprise people if they met NHL guys? CW: I think so. Especially if you are coming to a game, and you see your typical fight or something like that, which doesn't really take place in other sports. But really, that's just part of the game. We're going out there playing — hopefully within the rules — but once the final buzzer stops and you get off the ice, it's back to being who you are as a person. STV: You have a couple of Christian teammates here with the Hurricanes — guys like Matt Cullen and Eric Staal — and the influence of former Hurricane Glen Wesley. Is it important to you to have Christian brothers on your team? CW: It's really important. I think back to my rookie year especially. It can be pretty intimidating when you make the NHL for the first season. When I came into the Hurricanes dressing room, one of the first guys I met was Glen Wesley (now the team's director of defensemen development). He is a strong believer, and he introduced me to a church here in Raleigh, which was huge for me being new to the area and outside my comfort zone being in the United States for the first time. He really took me under his wing, and I was lucky to have a guy like that on my team. Obviously, he is retired now, and we have guys like Matt Cullen and Eric Staal. And as a team we have chapel here every other week to get together and reflect with one another, and just take a breather, really. Because, during the hockey schedule, it gets to be a grind with so many things going on. STV: Last year, FCA established a new national hockey ministry. For so long, FCA has been very popular in mainstream sports like football and baseball. With that in mind, how would you introduce hockey to a group of football players? CW: That's a good question. When you talk to athletes, everyone has things in common. We're all competitive people. But it would be awfully interesting to see big football players on skates. Personally, from a goaltender's perspective, if we could throw some of those big guys in the net, that would be great. They could probably cover up the net and stop a lot of goals. 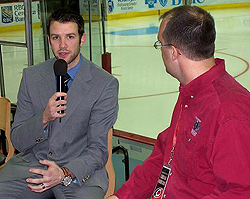 Ward (left) spoke at the 2008 FCA Night with the Hurricanes where he was interviewed by FCA Area Director Scott Williams (right). STV: You've connected with the FCA staff here in Raleigh and have spoken at some local events. How important is it for you to step out and share your faith in group settings? CW: I think it's really important and definitely something I'm growing into. Typically I'm a little bit more on the quiet side. But I realize that I'm in a position where, if I speak, people may listen, and, if I get that opportunity, like with today's interview, it's something I want to do. STV: When speaking for FCA events, what advice do you try to share with the kids who come out to hear you? CW: When I grew up, my dad always told me — and it was somewhat of a golden rule for him — that the more fun you have, the better you do. I strongly believe that. I think at a young age kids typically get a little too serious too soon, whether that be the kids or the parents. I think it's important for kids to enjoy the game for what it is and to have fun with it. In my position, making the NHL, you are kind of under the microscope and you get criticized here and there, so there is a little more pressure. But I still make sure that, every time I come to the rink, I come to have some fun. And I find that I play my best when I am having fun. STV: Cam shared some great thoughts about this, and we wanted to get your take on it, too. How does the rough nature of hockey affect the faith aspect of the guys who play it? MC: It might be a challenge for some guys. I'm not a big fighter. You can see that I'm not physically that big. But, you know, it is part of the game, and it's a real competitive game. Tempers flare, and, to be totally honest, some of the best Christian players I've ever met are guys who fight for a living. That may seem like a problem, but to me it's more of a way you learn the game growing up and part of a code within the game. Born: Nov. 2, 1976 – Virginia, Minn.
• Led the team last season in shooting percentage (15.8%) and reached the 20-goal mark for the second time in his career. • Netted his first hat trick on Feb. 22, 2009, against the Colorado Avalanche. I think most guys are able to separate the game and real life, because what happens on the ice is kind of something that you're born with. You play this way, and it's just part of the game. Then, when you're off the ice, you are yourself. It's funny. Some of the most physical, toughest guys that I've I ever played with are some of the strongest Christians I've known. STV: Being a tough competitor is an important part of being a Christian athlete. In your career, you've had to use that toughness to get through several injuries. What has God taught you through those situations? MC: Well, for one it brings perspective. When you are playing the game, you play 82 games a season and you're in the rink every day. Hockey can become everything to you and overshadow everything else. When you get hurt, you kind of step back and are able to have better awareness and say, "OK, I'm playing a game. It's important, but it isn't the end-all be-all here. This is hockey. I work hard at it, but I need to focus on certain other things." 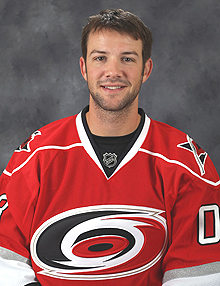 STV: You have a couple of Christian brothers on your team, including Cam Ward. Does it help you to have someone on the team who shares your faith? MC: No doubt. I tell you what — it's pretty impressive for a kid like him and Eric Staal, too. They are both the same age, and they impress me a lot. They are both young guys who have stayed strong in their faith and who aren't afraid to share it with others in a game where it's not as much of an accepted thing to speak about your faith. To see those two young guys do all that they are doing is really impressive. It means a lot to have guys you can confide in who share the same values and beliefs. We are able to draw from each other because there are so many ups and downs personally and as a group throughout the season. It's nice to have guys like that to feed off of. I've been lucky to play for a long time in the league, and I understand that there are ups and downs. And for me, I try as much as I can to help my teammates out as well. Maybe not outwardly in front of everybody, but when I can, I pull a guy aside and try to help him through hard times. And I would hope other guys would do that for me, just as so many have already. It really means a lot when someone pulls you aside and lifts you up. I think, as a teammate, and as a Christian, that is the best thing that you can do. STV: As FCA establishes a hockey ministry, how would you introduce the sport to people who are unfamiliar with it? MC: Hockey is different than any other game because you have to know how to skate before you can do anything, and skating is hard enough as a skill anyway. Getting into hockey can be a challenge for people who don't start when they are young. Most of us are from northern Minnesota, northern parts of the United States and Canada. It's freezing cold in the winters, and we have outdoor rinks to skate on. But it's a great game to play, and it's a great game to watch, especially live. It's really fast-paced and physical. Those of us who play it just love it. And you'll find that some of the most passionate fans in the world follow hockey. Photos courtesy of Gregg Forwerck/Carolina Hurricanes; Scott Williams. and coverage! Keep up the terrific works guys I've you guys to our blogroll. Thank you, I've recently been looking for info approximately this topic for a while and yours is the best I've discovered till now. Great items from you, man. I've bear in mind your stuff previous to and you're simply extremely excellent. I actually like what you've bought right here, certainly like what you are stating and the way in which during which you are saying it.